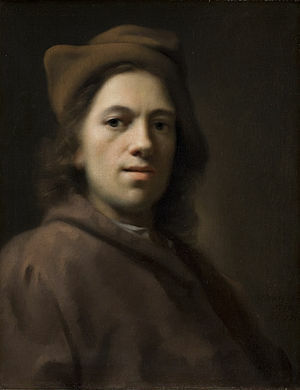 Balthasar Denner, born 15 November 1685 at Hamburg and died 14 April 1749 at Rostock, was one of the most important portrait painters of his time. His father was Jakob Denner, the well-known Dompelaar preacher of Hamburg-Altona; his mother was Katharine Wiebe. In 1710 Offenbach relates that among the important persons he visited in Hamburg was the Denner family; concerning Denner's parental home he remarks, "They [the Mennonites] in general all seem to be very fine and pious people." One of his best pupils was Dominicus van der Smissen, who married his sister Katharina. 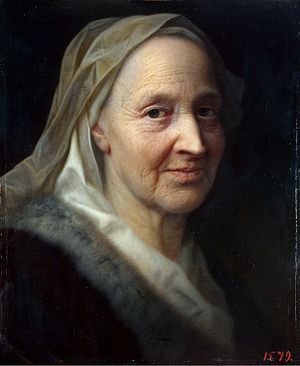 Wichmann reports in his history of Altona that Balthasar Denner had to paint an annual portrait of Countess Reventlow in payment for the use of the church in which his father preached for the Dompelaars. Allgemeine Deutsche Biographie. Leipzig, 1875-1912: V, 54-57. Hege, Christian and Christian Neff. Mennonitisches Lexikon, 4 vols. Frankfurt & Weierhof: Hege; Karlsruhe: Schneider, 1913-1967: v. I, 414. Lichwark, Alfred. Das Bildnis in Hamburg. Hamburg: 1898: I, 132-143. Wichmann, Ernst Heinrich. Geschichte Altona's. Altona: Haendcke & Lehmkuhl, 1865.
van der Smissen, H. "Denner, Balthasar (1685-1749)." Global Anabaptist Mennonite Encyclopedia Online. 1956. Web. 25 Apr 2019. http://gameo.org/index.php?title=Denner,_Balthasar_(1685-1749)&oldid=144962. van der Smissen, H. (1956). Denner, Balthasar (1685-1749). Global Anabaptist Mennonite Encyclopedia Online. Retrieved 25 April 2019, from http://gameo.org/index.php?title=Denner,_Balthasar_(1685-1749)&oldid=144962. Adapted by permission of Herald Press, Harrisonburg, Virginia, from Mennonite Encyclopedia, Vol. 2, p. 36. All rights reserved.